I did this artwork in response to seemingly high numbers of deaths this year, and it's only April. The community spaces (where wakes are held as most of us live in high-rise apartments, not houses) have been having funeral wakes consecutively since Dec last year. First and foremost on my mind is a friend's mom. It was a depressing period for everyone as circumstances were difficult (not going into details here)! Also I love cemetaries for the reason that they are a dying feature in land-scarce Singapore. Many old cemetaries have already been removed for malls, transport lines and apartment blocks; and the remaining few will eventually disappear as well. The current norm here is to be cremated, whereas if you'd like to a burial for personal or religious reasons, you pay a higher 'rent' and the remains will be exhumed after 15 years to make way for newer bodies. Tis a sad thing yes. Thats really sad but I know the feeling. 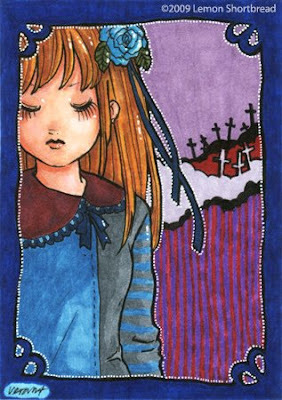 Its a nice aceo and highlights the sadness without looking too depressing.